Thanks! I'm stoked to get more work done on him. I'll do my best to have the character sheet up by the end of the week. Sneak peak of the character sheet, having a hell of a time doing smooth inks. Taking me forever and I'm not happy with the outcome so far. So it seems my incubator for The Mechanic was lost to the warp so I have begun anew! 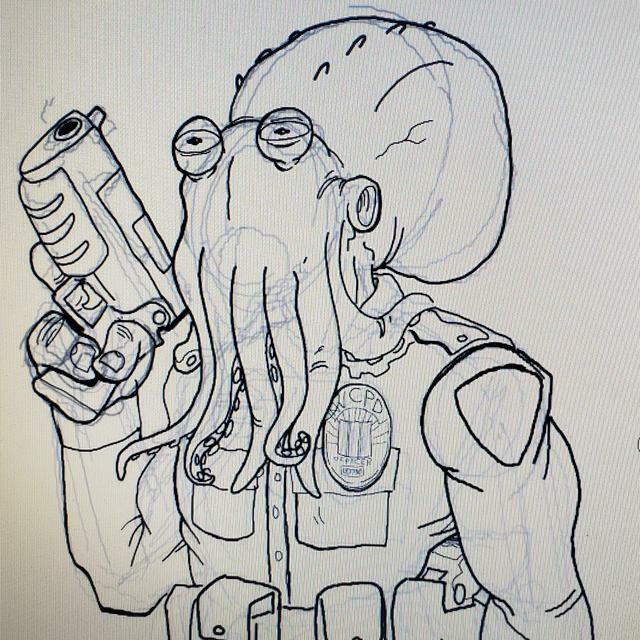 Here is a couple early sketches of my new character Octo-Cop. He is a hard working beat cop for the NVCPD and has been on the job for 15 years. He's seen it all. His 3 square miles of Void City are among the safest (by Void's standards) and his residents are extremely fond of their officer. He is very tough and honest and is extremely committed to protecting his beat. He also happens to have an octopus for a head. He is a Thull, an ancient magical creature with immense magical talent that have been worshipped as gods in millennia past. Octo however, is unaware of this as he was discovered and raised by a lower middle class family in the area of town he now patrols. His unknown powers, while untapped, still give him certain abilities. He can sense danger and can view events by touching inanimate objects, he writes these off as good cop sense and intuition. Due to his heritage he also has incredible strength and agility. His tentacles can stretch an incredible distance and are devastatingly strong. They are covered with hard suction cups and cover a razor sharp beaked mouth. Octo cares little for the politics of the city and his department and just wants to keep his little sector safe. He frequents the pub near his home after his shift most nights and loves beer and hotwings. I'm currently working on the character sheet and intro comic but have switched over to digital art which has not been an easy transition. I'm slowly figuring it out thanks to dozens of youtube videos. Thanks very much, extremely great to be back and to be so welcomed! Welcome back! I just came back myself. You can challenge a fighter you'd like to battle or throw out an open challenge. If I'm not already committed, I'd be happy to challenge you. I'm game, anything with The Mechanic is good with me! I've been working on a return to the Void now that life has settled down. This looks like a fun way to bring back The Mechanic. Look forward to meeting all the new faces! I'm very much for it, lets do it. Thanks! Hey folks, my current opponent had to bow out, anybody up for taking on The Mechanic? 4 week normal battle would be great or suggest one, I'm pretty much up for anything. That sounds damn cool, can't wait to see how it works out. Hey no problem, drop me a challenge anytime! I'm game for either, throw me a challenge. My wife and kid are going to Texas for a couple weeks and I'll have plenty of time to kill. Reviews / Re: So what comics are you reading? Thanks Johnny, The Losers is pretty damn cool, downloaded the first issue. I am a fan. Wei looks like a Tony Moore junky to me. But who can blame ya? I still haven't completely recovered from him leaving Walking Dead. The Exterminators is pretty damn cool. I've been reading DMZ, pretty cool. I'm a sucker for any comics military related. Other than that I'm waiting for the new Death Dealer book coming out soon if not already and everything Robert Kirkman cranks out. Been following Invincible and Walking Dead since the beginning. Cerebus and Bone should be mandatory reading for anybody drawing comics I think. And who can forget Pulpo, I musta read Vol. 3 four times already. I concur, lets make it so. I really like your character Scarn, I'll have to challenge you some time, I have moving and studying for my job to worry about now but you're on my radar. The base of operations for the Void branch of Mr. Cogg's is basically a flying city. It houses everything from scientists, aircraft, weapon systems, families, and even a garrison of soldiers. It has state of the art facilities and is completely self contained. Its Internal Ionic Stabilation Core keeps the station powered and in the air. The expansive aircraft hanger houses over 300 aircraft, ranging from historical to experimental. The factory endlessly produces the products for all of Void to enjoy and the R&D team is constantly steal...er thinking up new ideas every day. Mr. Cogg has a fleet of these floating bases though Void Base One is the largest and most advanced of the seven. Anchored over 10,000 feet in the air, the only public access to the base is through a teleporting invitation usually given by one of the Special Operatives of Fighter Outfitters. Attempts at flying (with or without the assistance of an aircraft) will result in the termination of said attempter. Sorry. The full catalogue is available on touch screen in the Customer Service waiting room and the staff is always friendly and ready to help. To contact a member of the S.O. team, simply leave your blood sample in any of the marked Cogg DNA Collection sites. If you are deemed worthy an associate will assist you immediately. Just posted the win pose for my character in the Incubator as well. Everyone let me know what they think. Hi! Name's Bryce, someone mentioned this place on DA, thought I'd check it out. Damn cool thing ya'll got goin on. I've already created my character, just waiting on my newly purchased drawing table to arrive so I can start my two page intial story. Lookin forward to being a productive member. Personal wise, I'm an F-16 mechanic for the USAF. I'm currently stationed at Luke AFB in Glendale, AZ. I've got a wife and a two year son.